Father’s Day Car Show – FREE Admission for all Father’s! Earlier this week I received the latest email newsletter from Safari Niagara. The last time bikers invaded Niagara Falls, tensions were high between police and Hells Angels members from across Canada. Eight years later, the roar of Harleys won’t be quite as ominous as bikers gather for Father’s Day weekend in June. The first annual Niagara Biker Rally aims to bring motorcycle enthusiasts from across Canada to town to raise money for charity. “It’s common knowledge that there are an awful lot doctors and lawyers and business people who enjoy riding,” says Niagara Falls Tourism board of directors president Wayne Thomson. After approval from the Niagara Parks Commission, the rally is scheduled for June 18 to 20. The main event is a mass biker gathering June 20 at 11 a.m. at the Rapidsview parking lot, where riders will begin a cruise along the Niagara Parkway to Queenston Heights, then back to the parking lot near Table Rock. 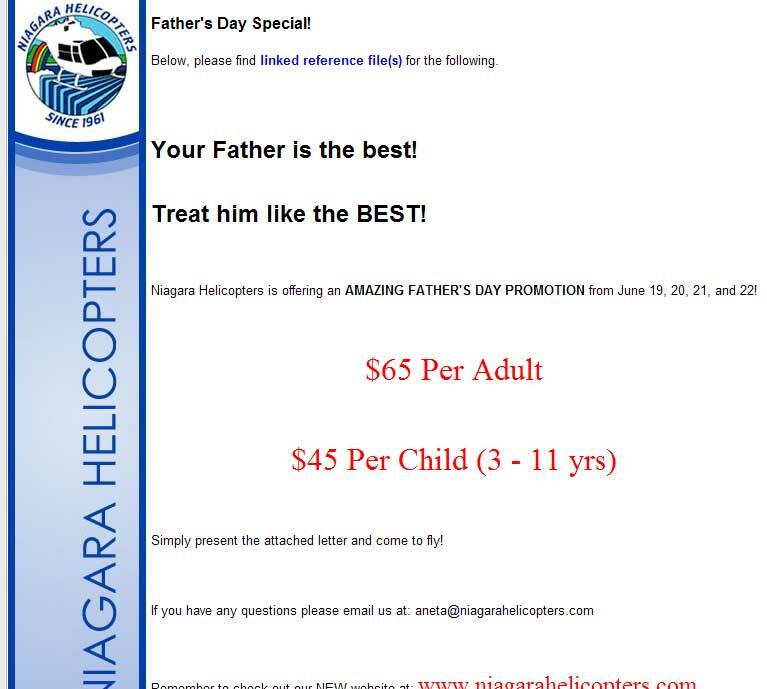 On Friday I received this email from Niagara Helicopters. Today is the last day for the deal.